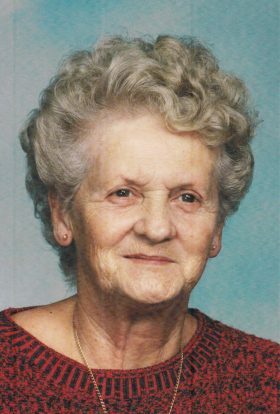 (nee Meier) Peacefully passed away November 9, 2018. She was born June 23, 1922. Mary was the beloved wife of late Alfred Meyer Jr. Devoted Mother of the late Diane ( Paul) Flitz, Donna (Donald) Comerford , Gary (Chris), Denise (Steve) Pagelsdorf, Dena (Jim) Schwochert. Doting Grandmother of Paula (Terry) Duch, Daniel (Sandy) Comerford, Thomas (the late Kris) Comerford , Timothy (Jamie) Comerford, Laurie (Jay) Romasko, Jamie Pagelsdorf , Eric (Chatchaya Phi) Pagelsdorf, Brandon (Amanda Aimers ) Goelz, Shayne Goelz and Bailey Schwochert. Loving Great-grandmother of Katie, Micheal, BreeAnn, Jacob, Julia, Ashley (Brian) Gothard, Sarah (Dan), Rehlinger and Brayden Goelz. Loving Great-great grandmother of Aubrey Rehlinger. Mary’s happiest times were with family and friends. She loved taking care of her gardens and cooking for family and friends.